However, increased obliquity has another effect. It changes the amplitude of the lunar orbital precession. The lunar orbit is inclined at 5 degrees to the solar ecliptic and precesses with a period of 18.6 years. The maximum declination of the moon at ‘lunar standstill is currently 28.5 degrees and this occurs every 18.6 years, as shown in the diagram. However 7000 years ago the earth’s tilt was 24.3 degrees compared to the current 23.5 degrees. The obliquity is also decreasing so that in 12000 year time it will be only 22.6 degrees. This entry was posted in climate science, Science. Bookmark the permalink. Thanks for calling my attention over the change of tidal energy dissipation changes with obliquity. I had already looked at the issue of tides during the Last Glacial Maximum, but believed most of the changes were due to the change in sea level. Arbic, B.K. et al. 2004. Ocean tides and Heinrich events. Nature 432 460. Griffiths, S.D. and Peltier, W.R. 2008. 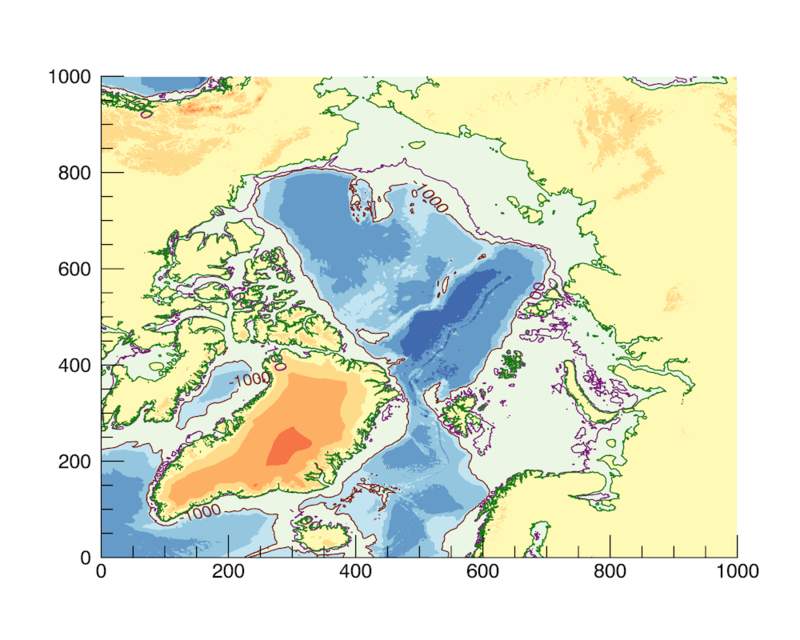 Megatides in the Arctic Ocean under glacial conditions. Geophys. Res. Let. 35 L08605. because I believe that an explanation that is consistent with the evidence is that Dansgaard-Oeschger events and its successor, the ~1500 years oceanic cycle during the Holocene are caused by strong tidal effects. One of the problems of the hypothesis is that the cycle has changed in spacing from about 1470 years average for the last glacial to about 1400 years for the last three cycles during the Holocene. If I understood correctly the length of the lunar cycle should change with obliquity. Should it become longer or shorter with declining obliquity? Do you know by how much? The effect of changing obliquity is to increase the latitude range of spring tides. So the moon reached a higher declination at full/new moon 15,000 years ago than it does today. An extreme declination occurs at every ‘Maximum Lunar Standstill’ every 18.6 years . The maximum horizontal component of the tidal force acting on the oceans is at roughly 45 degrees to the declination. That means that tidal currents in polar regions were significantly stronger at LGM. The strongest effect though is as you correctly identify, the very low sea levels which increased tidal energy dissipation in the shallower seas and narrower channels. My only new result is the extra boost added to tidal flows due to higher obliquity. As far as I am aware this has never been considered before. I believe the effect is as least as large, if not larger than any 1470 cycle of slightly enhanced tides. Post: Eccentricity and precession just modulate the seasonal balance at each pole. For the last 800,000 years obliquity alone has been insufficient to end glaciations, and the reason for this is still not fully understood. This is the question that pops into everyone’s mind upon learning of Milankovitch Cycles. The ice cores temp reconstructions clearly show an M-cycle effect yet with clear enough correlation to definitely tell the story. Tides are a good candidate as a player and I have not seen them discussed before. So what drives glacial cycle? 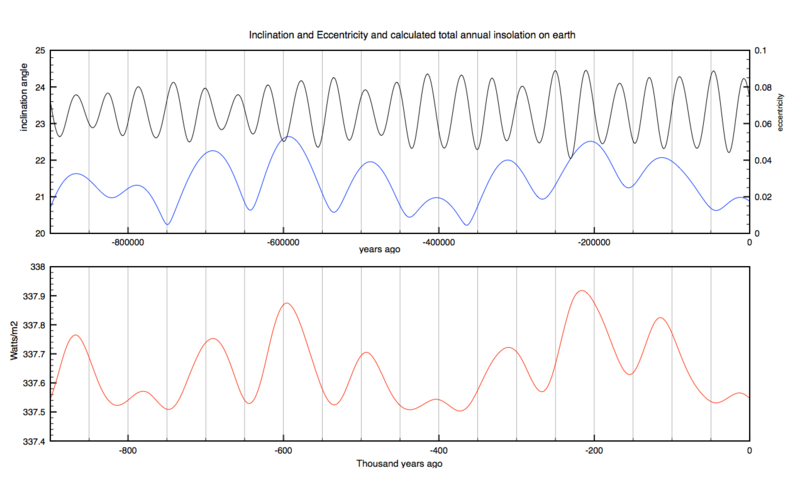 The most reasonable hypothesis would be that energy thresholds are needed to flip the glacial-interglacial switch. A major player involved in the system is the Atlantic meridional overturning current. The AMOC is a major factor in the Earth’s ability to dissipate heat from the tropics to the poles. This could affect global mean temperature GMST through modulation of ice cap affect on albedo. My belief is that the annual polar melt acts like a pump to promote the overturning, with alternating north and south summers acting like pistons. If this is true, the more summer-winter variance the more melt and the stronger the AMOC. Variance is increased by high obliquity, high eccentricity and precession that is in sync with eccentricity to make higher max/min insolation. Added to this, is the vulnerability of GMST to periodic surface cooling events such a super-volcanoes and asteroid strikes, which could flip the glacial switch. Also, it seems evident from the cycle that glacial maximums create vulnerability to global melts. This could be under the bigger they are the harder they fall dynamic due to pressure caused melting to undermine glacier foundations. Then there is the dynamics caused by the NH being continents surrounding sea and SH being the mirror of that. Glacial cycle is a NH effect. Having a uni-polar dynamic surely amplifies the precessional-eccentricity maximum effect. Tidal intensity could have an effect. I would be curious to know the reasoning for tides to enhance the AMOC versus interfere. Mine is that the glacial cycle has obliquity as primary driver, with precession as a secondary driver. That explains why for most of the Pleistocene interglacials were spaced by 41 kyr. However the planet got so cold that eventually the obliquity cycle literally had not enough time to warm the planet out of glacial conditions so it started to fail some cycles. Then a new mechanism started to help obliquity, but only every 2 or 3 obliquity cycles. This mechanism is clearly a powerful feedback that only acts when the Northern Hemisphere is covered in huge ice-sheets. My guess is that this mechanism has to do with both ice-sheets and low sea levels. Probably the low lying ice sheets melt much faster with rising sea levels due to the higher thermal capacity of water over air. The more the ice melts, the more the sea rises, the more the ice melts. This fast feedback allows obliquity to melt more ice in less time and therefore reach the interglacial threshold before obliquity starts falling. Precession determines at which point in the earth’s orbit northern hemisphere summers occur. Likewise for the southern hemisphere. If the earth’s orbit was circular then precession would have no effect at all on insolation. The higher the eccentricity of the orbit then the larger the NH/SH summer imbalance becomes. 800,000 years ago the ice sheets got so large that obliquity alone was insufficient to end an ice age – except not quite. You can see that when the eccentricity amplitude was highest, glaciations nearly did end at maximum obliquity, and then only lasted at most 2 obliquity cycles. We are currently in an era of low eccentricity amplitude in the overall 400k cycle. For this reason the last glaciation was the deepest ( together with that 400,000y ago) and has the classic sawtooth shape. So what finally caused the collapse of the last glaciation at maximum obliquity after 2 previous failed attempts? My bet is either a) or b) or perhaps both combined. But if we go with the solar system precesses and not the earth then that would alter a few insolation graphs and may complicate or simplify looking at glaciations. Clive, I agree that it was a undoubtedly a combination of factors. I guess the question is how much did each one contribute relative to the others. I think we all agree obliquity is #1. BTW, I think you meant dust increased emissivity which decreased albedo. The question that should interest humanity what triggered the end of past interglacials. Super-volcano? Asteroid strike? With your last two articles I have been looking for signs of an 18.6 year cycle among my various datasets. I did not find it in the temperature datasets but I may have found one in heat content. On WUWT I saw an interesting chart of heat content. I have never looked at this before. So I analyzed the data trying to duplicate the chart I saw. This is what I got. I sorted everything by period and the 18.661 cycle is near the top. I hope this has meaning to you. When I input the table it looked a lot better than what you see above. Here it is as a figure. That is very interesting because one place you may expect to see a signal is in global heat content. Tides help drive the Meridional Overturning Current (MOC) because tidal drag acts at all depths in the ocean. You can imagine the moon changing its latitude position moving from the Northern Hemisphere to the Southern hemisphere as it orbits earth. There are 2 bulges nearside and opposite to the moon. The diurnal tides are caused by the rotation of the earth. The extent of the N-S drag depends on the declination of the moon and this varies on an 18.6 year cycle reaching a maximum of 28.5 degrees during a lunar standstill. Therefore one can see that the strength of the MOC may well depend on the latitude extent of tides, especially at high latitude. This then is reflected in overall heat content. For the last 800,000 years obliquity alone has been insufficient to end glaciations, and the reason for this is still not fully understood. titled “Modulation of Ice Ages via Precession and Dust-Albedo Feedbacks”. I agree that the Ralf Ellis paper is the best explanation yet for what finally ended the last glaciation. See Does Gaia end Ice Ages . Dust enhanced albedo works when insolation alone fails to melt the ice sheets, combined with dry arid conditions at northern latitudes. However, I don’t think it explains every termination over the last 800K years. It becomes the critical factor when eccentricity is small, as happened 20,000 years ago and 400,000 y ago. For example the last but one glaciation is not driven by dust feedback. The Nino region daily data is now up through September 1. I do look at the weekly data too but I prefer the daily data. I do like being able to look at the day-to-day variation. Since I like the daily data I have taken the time to use a spreadsheet. You will notice the monthly data are as included as well. I am glad I switched to using a combination of monthly and daily data. I started using the daily data beginning in 2014. I don’t know what schedule they are on for the daily updates but every Monday they do update the weekly data. Unless something drastically changes I likely won’t issue anything further until the next daily update. There is a scheduled update for the heat content I looked at scheduled for September 10. I don’t expect changes to the analysis but I will investigate it regardless. I think what happened here on your article is the way it is supposed to work. You wrote an article and brought up the l8.6-year lunar cycle and in investigating another dataset I was able to find evidence for that. The answers to many questions can be found in the data. I think we have agreed on that. Recently, I had another bad experience on another website. You had cautioned me on this. I posted my analysis of Nino region 3.4. It got nowhere; there was little interest. The other thing I observed this weekend was another demonstration of how poorly the climate models perform when compared to measurements. This has certainly been around a while. When I look at that I remark to myself that I would have never presented to my management that the climate model is suitable for policy decisions. If it is a model I was developing on my own I would have concluded after seeing comparisons to measurements that I was missing something important. Perhaps, I had failed to consider a process that was important. Maybe this is the way things are in the hardware business where I spent my life. Are there different standards in the theoretical world of climate science? I have a little story from my hardware experience. Most of the things I learned came from data measurements. We did not have a working rotor dynamics model. Another contractor (we did share data) instrumented a Kingsbury thrust bearing on one of their units and one of the things that was learned is that the loads on the pads were not equalized. That did not match the theory so the data were dismissed but not by me. I made note of it. About 10 years later we decided to investigate an alternate design to the Kingsbury thrust bearing. To complete the task, we designed a test fixture which would enable us to have comparative data between the Kingsbury bearing and the alternate. We again learned from measurements that the Kingsbury bearing was not equalizing the load. That is twice now. From the program we determined that staying with the current Kingsbury design was the way to go. There was no compelling basis for the alternative. In the design of another unit that was much larger this aspect of the failure to equalized loads came around to bite us. I reminded people at that time that we ran through this stop sign twice. Theory was wrong. Alterations were made to the design to fix the problem. I think the same thing is going on here with the climate models or am I wrong? We continue to run through the stop sign. I see thread after thread about esoteric issues in the models but no one is willing to say that there is something fundamentally wrong or missing. Some have strongly suggested more thorough inclusion of natural variability should be a consideration. I think that could be it; at least that is what my work indicates. I also realize that with what is spent worldwide on mitigating CO2 that there are some vested and powerful interests that will do everything they can to preserve the insider deals they make. We can’t give in. We must get to the truth and I think that will come from the data. BTW, new weekly Nino region data came out today. In all four regions the data was exactly the same as it was the week before. It was flat. I agree that the best strategy is to propose effects or identify signals in data and then see how others view it. We should never be afraid of appearing stupid. I think climate science is locked into a long term bet which it can’t afford to lose. The IPCC has become like the Pied Piper urging governments to abandon energy driven growth to lead them to some promised land. There are huge financial resources committed to so-called green energy, supposedly to curb the planet from warming by 2C. Many thousands of people’s livelihood now depend on this long term bet coming true. That is why they stridently shout down any detractors, especially other scientists. If I may be allowed to take a personal view of the situation. – Trying to reduce drastically CO2 emissions with renewable energy will not work. Solar energy may eventually be productive in deserts. Energy storage is too inefficient and will probably always remain so. Nuclear power is the only zero carbon energy source that makes any sense. Fusion needs to be developed this century. – Yes there will be a small increase in global temperatures, but this is unlikely to be any sort of disaster. Warming mostly occurs in colder regions and not in the tropics. There will be no uninhabitable zones. – The basic problem facing the world is over-population. Climate change is just a symptom of this basic problem. So too is pollution, deforestation, species extinction, migration etc. etc. Can human’s evolve enough to stabilise their population willingly? I have my doubts whether this can happen peacefully. Perhaps the IPCC should instead push for birth control , and get countries to sign up to a 3 child family target instead of random emissions targets! You wrote: The basic problem facing the world is over-population. In History, this same thing has been stated over and over and over. Each time the disaster did not happen and the population blew past the barrier and resulted in more and more people living better than before. More people work better together better and accomplish more and achieve more productivity. Many powerful people promote the over-population statement and have control over media to scare most people, but the actual data to support the proof of coming disaster has not been found. History has proved, many times, growing populations are healthier than declining populations. Fossil fuel will carry us into the Nuclear age that is barely started. The real end will come when our Sun dies, far in the future. Killing ourselves with renewable junk energy is pointless. 100% agree. Excess population will In the end have to be addressed. The ice core data has all the information needed to understand the temperature cycles of the past. The understanding gained from ice core data can be extended backward millions of years before that because the same factors were causing the not understood changes. The efforts of the past and present have been and are to associate external forcing to temperature. The internal response of the earth using oceans and ice have been dis-regarded completely. Glaciations occur because oceans are deep and warm and thawed and it snows and places the water on land as ice. The ice thaws and flows and advances and the thawed meltwater forms more snow. The ice slowly depletes as the extent increases. Snow from ocean and meltwater falls on the ice sheets but snow also falls on Antarctic, Greenland and high mountains. Gradually, ice is sequestered where is is removed from taking part in the next cycle. Each glaciation ends when the ice is depleted and begains to retreat. Each retreat and warming starts the snowfall for the next glaciation. When oceans are deep and warm and thawed, it snows more than enough to replace the ice that thaws every year. When oceans are shallow and cold and frozen, it snows not enough to replace the ice that thaws every year. Maurice Ewing and William Donn explained all this sixty years ago, before ice core data was available to help prove this is true. Major ice age cycles ended because enough ice has been sequestered and cannot take part in the cycles. Thermal interim of the oceans is indeed important and plays a role, but cannot explain the 100k year cycle. Changes in the earth’s obliquely bring more solar energy to high latitudes every 41,000 years triggering a melt back leading eventually to a collapse of the ice sheets. The cycle then repeats. Ice volume is the most at the time the temperature is dropping the fastest, ice extent is the most when the temperature is the coldest. Ice volume is the least when the temperature is increasing the fastest. Ice extent is the least when temperature is the warmest. This works just like glaciers that we have studied. Some retreat because they are depleted of ice and flow slower. Some advance becaue they have plenty of ice volume and weight and flow faster. Ice is cause and not result.